Did you know that today 11/11 is also known as Singles Day? Singles Day was started by Chinese college students in the 1990s as a version of Valentine’s Day for people without romantic partners. It got the name Singles Day because the date consists of four ones: 1111. Since the 90's, Singles Day has evolved into the world's largest online shopping day with some of the seasons best deals -- even better than black Friday and cyber Monday. Now may be the time to get an early jump on your holiday shopping because these deals are not to be missed. As one of the largest deal and coupon sites, Dealmoon.com is here to introduce this new trend and the greatest deals for you to enjoy and shop online today. I've been looking around Dealmoon site and I found some really amazing beauty deals from some of my favorite beauty brands. With deals at stores like Estēe Lauder, Clinique, Philosophy, Peter Thomas Roth, Elizabeth Arden, Perfumania, I found some really great deals and coupons that are good for today, Singles Day, only. There is an awesome deal at Peter Thomas Roth for 80% off on Peter Thomas Roth best selling Un-Wrinkle Turbo. It is normally $100, but today, with the special deal it is just $20.00. 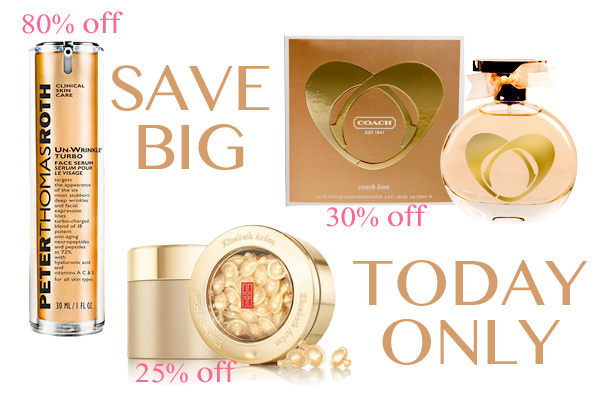 Then there is 25% off at Elizabeth Arden with a special code plus a deal where with every order you will receive a FREE 8-piece Beauty Collection that is worth $87 on top of that. Another great deal that is not to be missed is 30% off everything at Perfumania with this special deal that is good only today. Head on over to Dealmoon.com now to shop these great beauty deals, plus many, many more. Disclosure: This post was sponsored by Dealmoon. Please see disclosure policy for complete information.